A 25-year-old man who punched another man on the head was fined £200 last Thursday at Banbridge Magistrates Court for disorderly behaviour. Brian Jamie Smyth, Knockburn Gardens, Lisburn, was also ordered to pay a £15 offender’s levy. 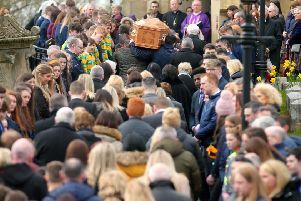 The court heard that on December 20 last year at approximately 1.30am in Church Square, Banbridge, Smyth was seen to run towards a man and punch him on the head. The defendant tried to flee from the scene but was arrested by police. There had been a history between the parties and the injured party did not want the matter to proceed any further but because of what police had seen they brought the disorderly behaviour charge. Smyth, who pleaded guilty himself in the court, apologised for what happened.